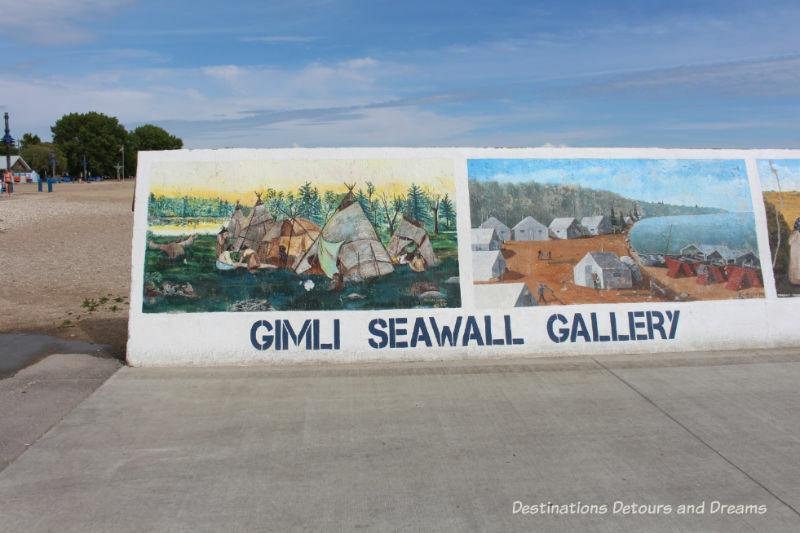 Gimli, a small town in Manitoba’s Interlake region, is located on the western shores of Lake Winnipeg about an hour’s drive north of the city of Winnipeg. Lake Winnipeg is a large lake with sandy beaches and wide open waters containing pickerel (known as walleye in other parts of the world), whitefish, goldeye, and other fish. Fishing and tourism are key parts of Gimli’s economy. 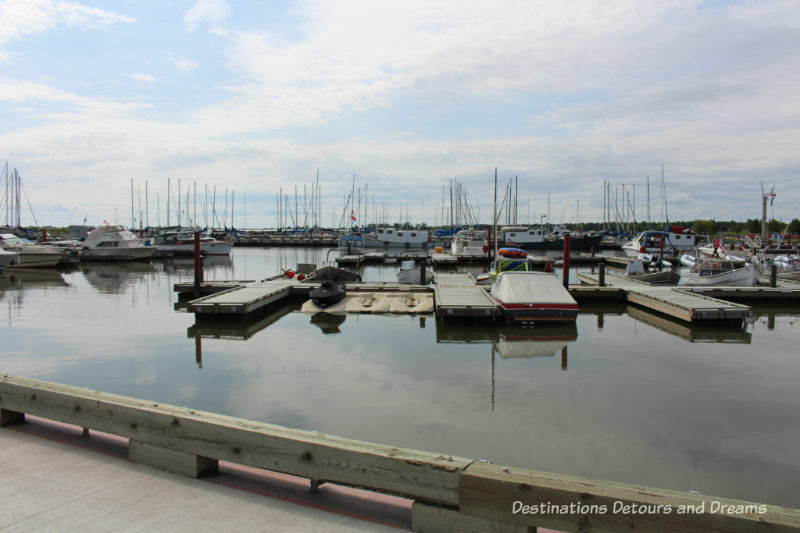 Boating is popular and the marina in Gimli Harbour contains yachts, sailboats, and other fishing and pleasure vessels. 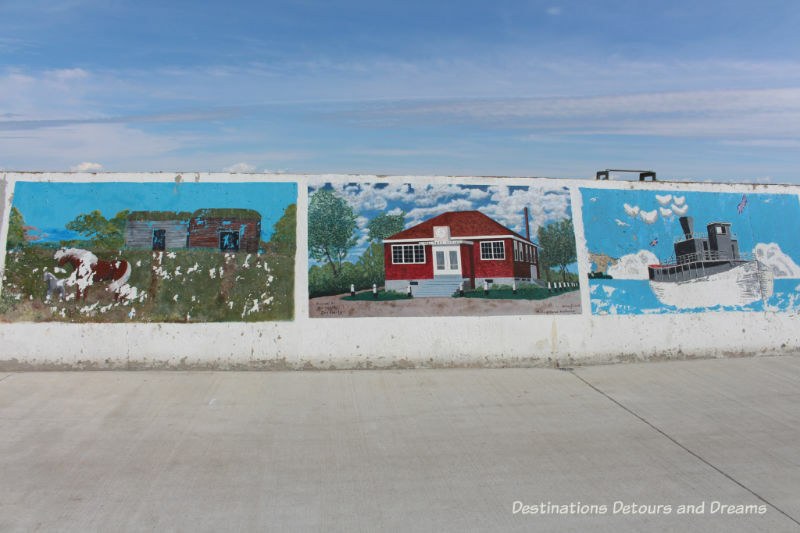 One of the attractions in Gimli Harbour has nothing to do with boats. It is the gallery of murals on the seawall running the length of the pier. 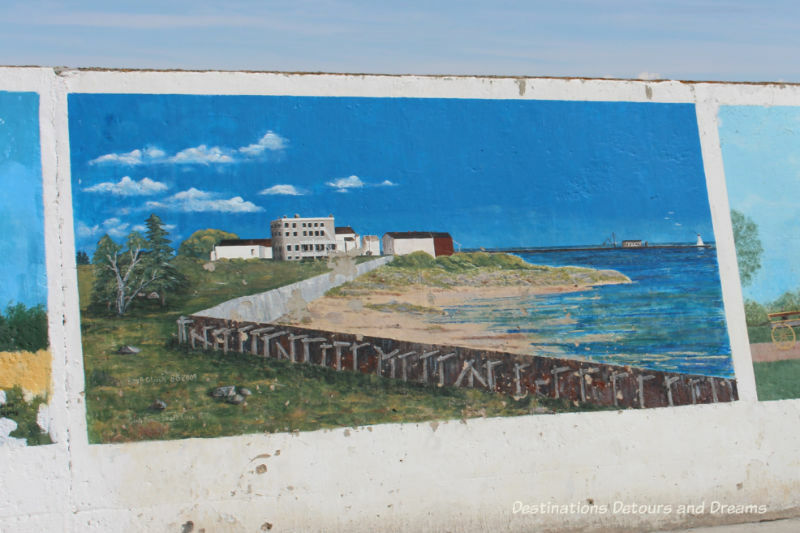 In 1977, the Gimli Art Club decided to transform an unsightly, grey cement protective wall on the pier. The six-foot high wall runs for 977 feet. 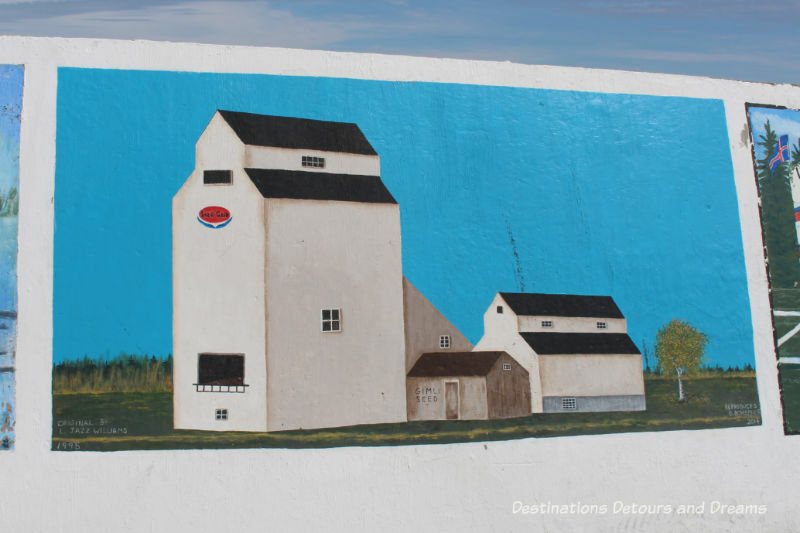 Artists put in thousands of hours creating scenes about the life and history of the Interlake area. Today, the original 36 murals have expanded to 72. Lake weather is hard on the murals. Some weather better than others. Restoration is an ongoing process in the summer months. 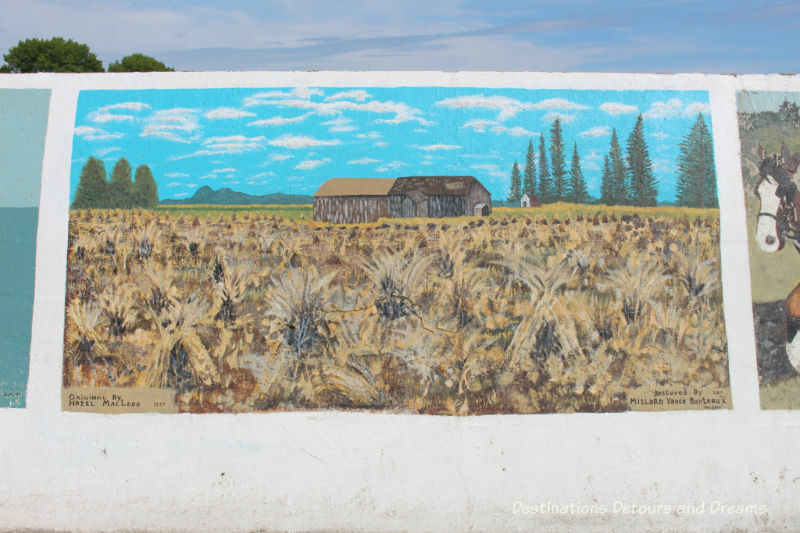 In some cases, older murals are replaced with new ones. Proposed new mural designed are vetted by a curatorial committee. 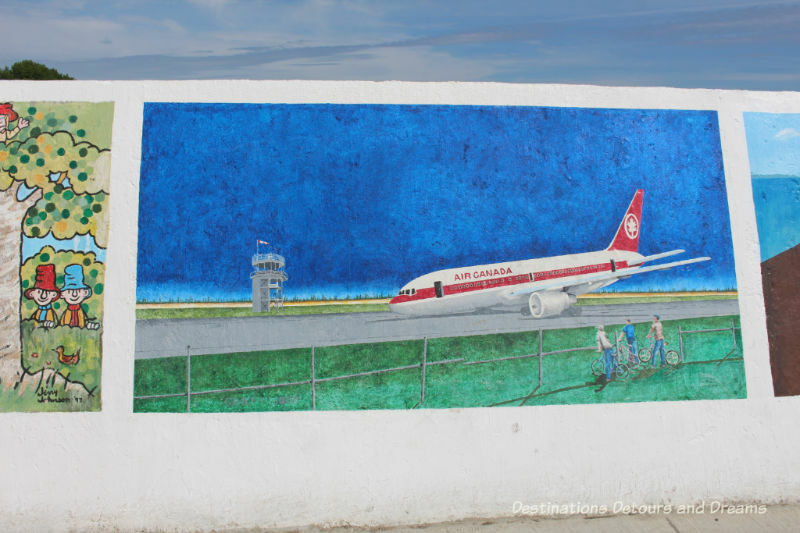 This mural depicts the story of the “Gimli Glider”. 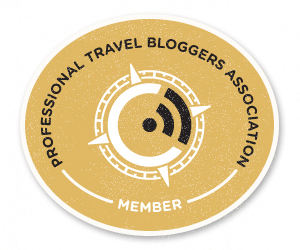 In 1983 an Air Canada Boeing 767 jetliner ran out of fuel enroute from Montreal to Edmonton. The pilot glided the plane to a safe landing at a former Royal Canadian Air Force base in Gimli. 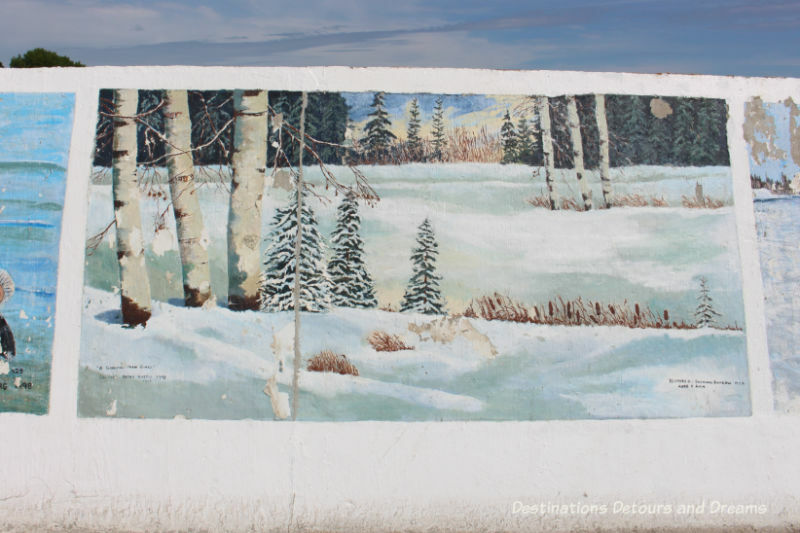 This winter scene was originally painted by Kathy Hastie in 1998 and has been restored by Suzanne Barrow in 2008 and 2014. 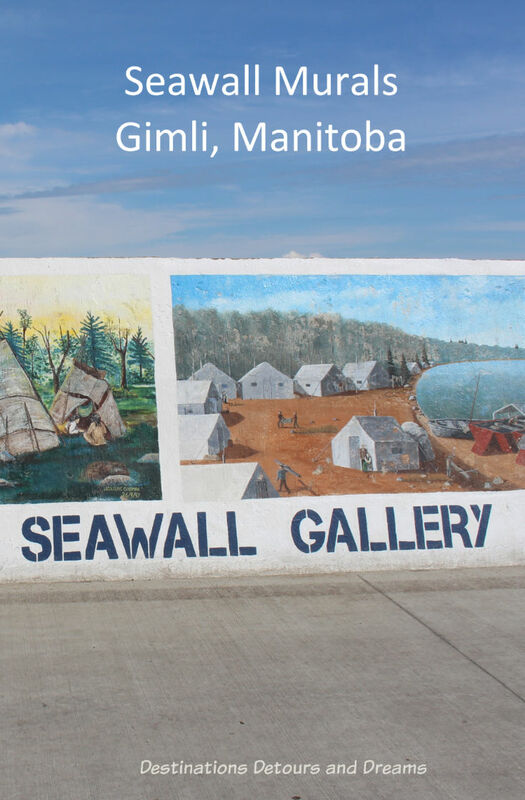 The Seawall Gallery turns Gimli’s pier into an art and history walk in a scenic lakeside setting. 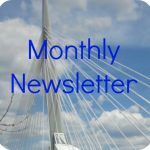 I go up to Manitoba’s Interlake area several times every summer and make at least one or two stops in Gimli. 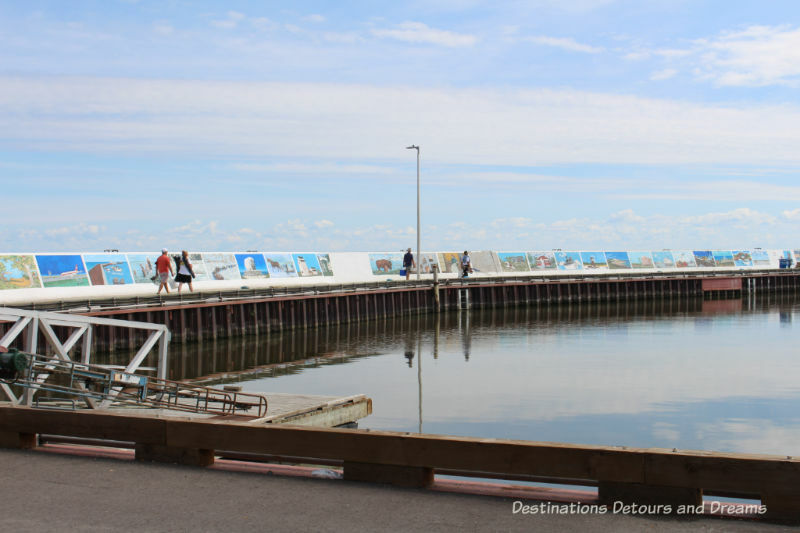 I always enjoy strolling along the seawall to view the murals on one side and the various boats in the harbour. And of course we have to have a pickerel lunch, usually at Kris’ Fish & Chips. Eva, I like to stop for fish and chips too! I love to see things like this. It’s putting art in public spaces instead of hiding it behind museum walls. Ken, things like this do make art accessible. I am also a fan of murals on buildings. What a great use of space. A 30something helping his dad work on my house yesterday showed me a mural he created on a wall in his apartment. I suggested he go up the street to a big hunk of ugly building that I’ve been wishing would get a mural painted on it. Wouldn’t that be fun? I think it’s great that Gimli both brings in new paintings and restores some of them. Admirable. RoseMary, I love murals on buildings. They can dress up ugly buildings, They can also tell stories about the area. These murals are great Donna. 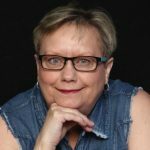 How cool to get a glimpse into scenes from Lake Winnipeg and the town of Gimli in both the past and present. I’d so love to see them and I’m sure they’re enjoyed by the residents and visitors alike. 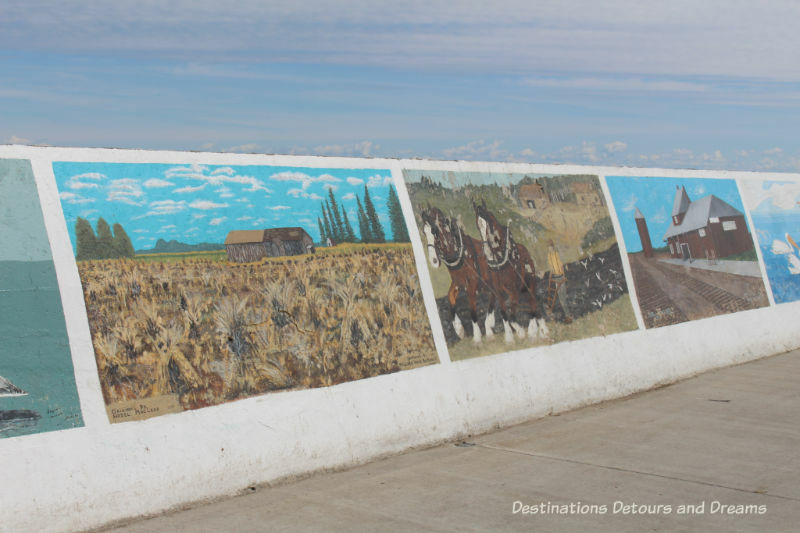 Anita, the murals do give a bit of a history lesson in addition to adding a lot of beauty.